If you are at the crossroads when it comes to your plant safety budget and the need to maximize safety at blind corners or intersections in your facility, it may be well advised to take a broader perspective when designing the best solution for this component of your forklift safety program. Collisions involving forklifts and people remains a far too frequent occurrence in the workplace. 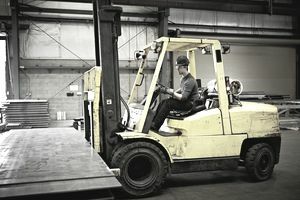 Forklift-related accidents in warehouses kill close to 100 workers each year and result in serious injury to over 20,000 additional employees. Approximately18 percent of all forklift accidents involve employees or pedestrians being struck by forklifts. Settlements for lawsuits arising from forklift accidents often begin in the range of $100,000 or more, according to one vendor of collision avoidance systems. This does not take into consideration other cost impacts involving workers’ compensation claims, productivity losses, property damages, and staff replacements. While every attempt should be made to increase safety by physically separating pedestrian and forklift, or by establishing clear traffic rules, the reality is that work seems increasingly fast-paced with less opportunity to react to an impending collision. Additionally, companies are often faced with frequent turnover of staff and as a result, they have inexperienced workers – both operators and non-operators alike. With this in mind, various strategies have been developed to reduce the risk of collision between pieces of material handling equipment, or between material handling equipment and pedestrians. The most common approaches to an intersection or blind corner safety include the use of mirrors and the practice of stopping in conjunction with the honking of horns before proceeding onward. At a design level, modern facilities now have separate doors for personnel and material handling equipment to reduce the risk of collision. There are, however, other innovative approaches that may warrant consideration. For example, Collision Awareness offers its LOOK OUT™ product line of sensors and warning lights designed to avoid forklift accidents by alerting operators and pedestrians of approaching movement. In addition to bright attention-grabbing color and graphics, when traffic approaches a blind corner or intersection, a motion sensor triggers a warning flasher. The signal lights use energy efficient LED lights that last 100,000 hours before they need to be replaced. They use a low-voltage 24v power source and come with 25–50 ft. of wire for easy installation. Another product of a similar nature is the Fork Alert™ Safety System. Fork Alert™ warns pedestrians and forklift drivers that a forklift is approaching, giving a 4 seconds notice and thereby reducing the risk associated blind corners or doorways. Plant and warehouse collision avoidance is serious business, and it might be well worth your while to explore this class of products to see if it makes sense for your operation. It should be stressed, however, that such technology is not a cure-all, but rather a supplement to enhance an established in-house material handling equipment traffic safety program, including such elements as training and effective accident investigation.